I was so pleased to see the sun come out today with hardly a cloud in the sky. This was to be my upper body workout day in the gym but I elected to trade in barbells for my bike. By 11:00 I had my domestic chores done and my bike ready to head south. The temperature was at 42 degrees and a bit warmer that the weekend prior. I started south on Hwy 99 but found alternative parallel routes whenever I could. This less than direct route was much more enjoyable as I got to see new areas and found roads and paths where I could escape heavy vehicle traffic. I found the Innerurban Trail south of Lynnwood and was happy to take it. The paved surface without cars to beware of was a nice change of pace. I hit the pedals hard to get a good workout until I took a detour in NW Seattle and headed towards Green Lake. 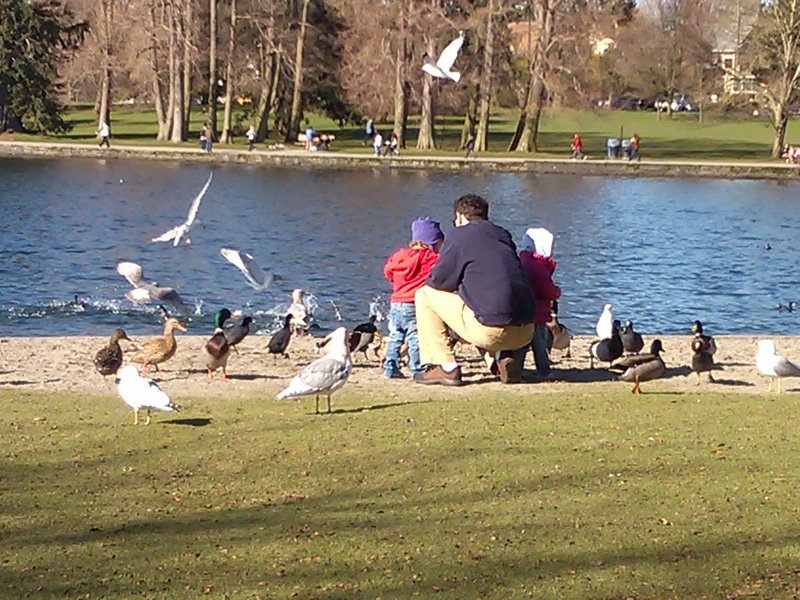 Green Lake, it seems, is a lunch time destination for many others. 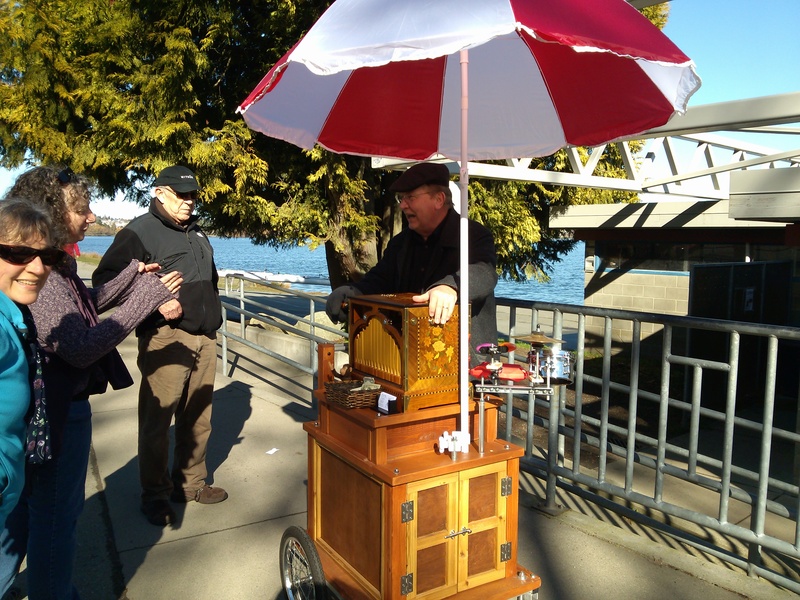 The sound of music drew me to the SW edge of the lake where I found Gary the organ grinder entertaining many others. There was a festive, carnival feel in the air and I took a short break on one of the nearby benches to soak it in. Gary Harding, Aka “The Ginder”, used to teach music, now he plays music in the park to benefit others. I took the 2.8 mile path that circles the lake and found several photo opportunities. I tried to get a photo of a guy riding his bike with a large parrot perched on his shoulder but they were gone before I could deploy my camera. I completed my lake lap and headed south again. I think what made this trip even more enjoyable was that I had no agenda. My plan was to explore south towards Seattle and go to the point where I knew I could make it back home before dark. 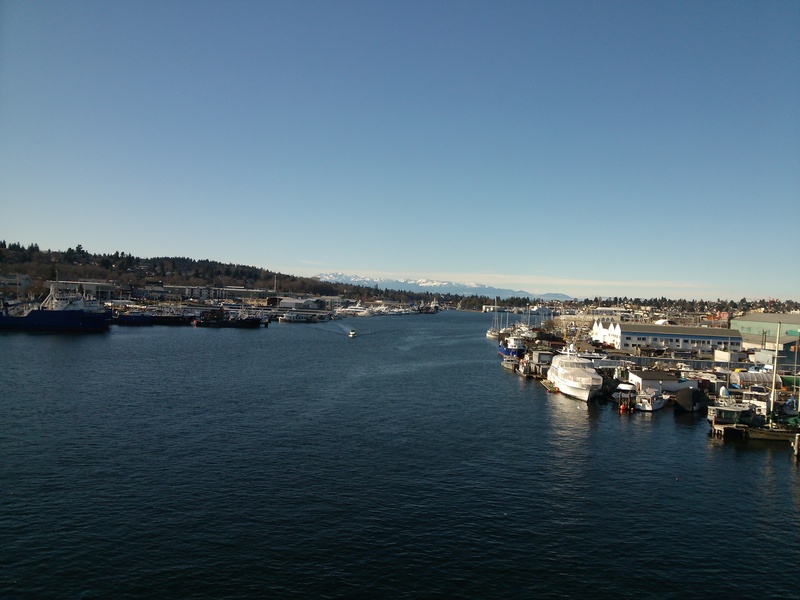 I explored the residential district as I took Freemont Avenue N. I crossed the Ballard Shipping Canal on the Ballard Bridge. 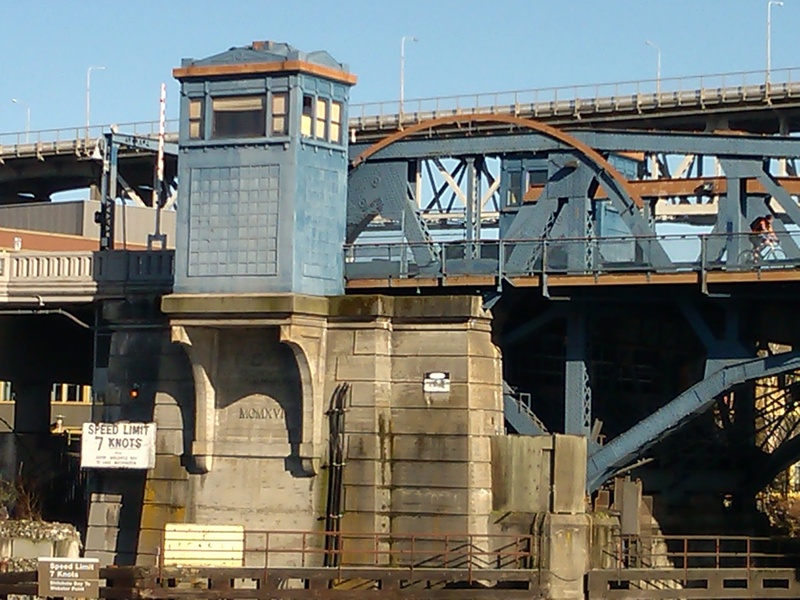 It is just east of the locks that join Lake Union with the bay. 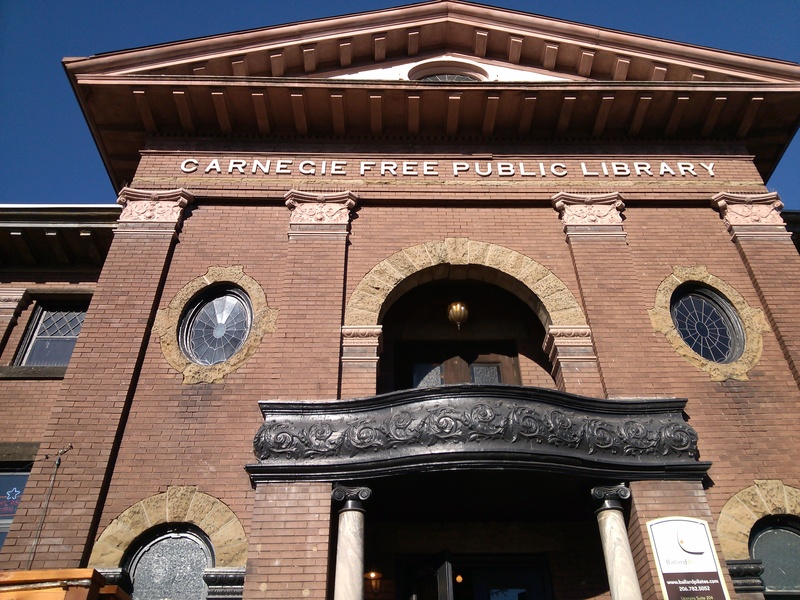 I stopped to enjoy the architecture of the Carnegie Free Public Library. This building was built in 1904 in part with chain-gang labor compliments of those incarcerated. I love these old buildings. Built in a time when form was as important as function. I stopped at a courtyard Greek café in the Freemont District. There is definitely a free spirit alive in this area which can be seen in the people and art. I enjoyed a Gyro in the sun and spent a bit of time relaxing and people watching. 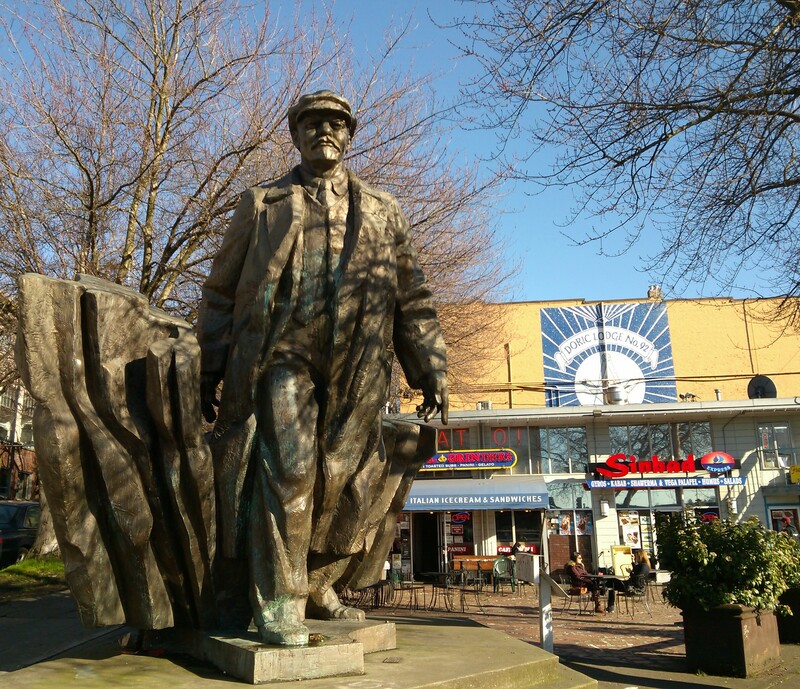 The edge of the courtyard has a very large bronze statue of Vladimir Lenin erected. This statue was moved here from Czechoslovakia. I explored the area of West Queen Anne before turning my bike back north. 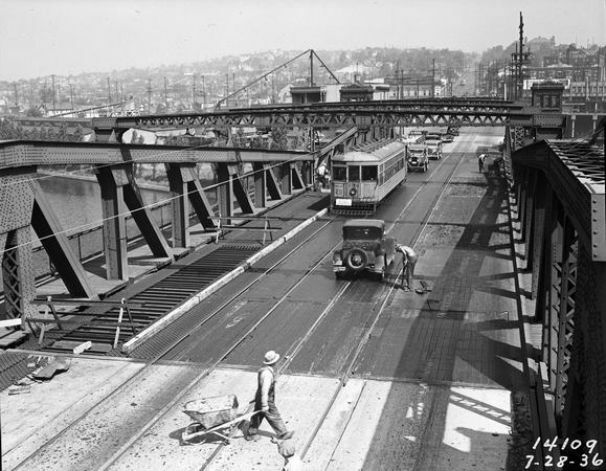 I tried to take a different route home and found myself sidetracked again at the Freemont Bridge. This draw bridge was built in 1916. It has recently undergone some renovation work and it looks great. I explored the maze of paved trails that are in this area and followed one of these along the ship canal. I realized that all good things must come to an end and picked up the pace as I headed home. After packing my bike and equipment away, I enjoyed a nice hot shower and glass of red wine. This was a great day. I can’t wait until the mountain snows melt and I can continue on my Mountain Quest. Thanks for joining me on this ride. This entry was posted in Bicycling, Freemont, Mukilteo, Photography, Seattle, Uncategorized, Washington State. Bookmark the permalink. Ah, a wonderful urban adventure, and a sunny day to boot. Just at the north end of the Fremont bridge is one of my favorite little acoustic music shops, Dusty Strings. After you descent a steep flight of stairs, you push open a big old heavy door, and a guitar pick mounted on the top of the door scrapes across the strings of a dulcimer fastened (upside down) on the ceiling… Now you know you’re in Fremont! What a great day to be riding! Next time instead of driving to Yelm for a visit … why not ride?